The new year is off to a great start: I am extremely happy to report that the manuscript of Managing Media Work was sent to the publisher, Sage, today. [UPDATE: 28 Feburary 2010] According to the Sage website, the book is scheduled for publication in July 2010 (Paperback ISBN: 9781412971249, list price: US $39.95; see also on Amazon). The Managing Media Work volume comprises original work by 27 international scholars in the fields of media management, media production, and media policy studies. Given the increasingly global, networked, and unpredictable nature of the media industry, and the growing complexities of media work, the challenge to the future of the creative industries seems to be a uniquely managerial one. 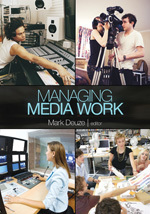 The authors in Managing Media Work address in detail how media management can and should prepare itself for the future. Management is seen here not just in traditional terms - as in designing business models, contemplating finance and accounting mechanisms, structuring strategic partnerships - but more so in strictly human terms: the management of talent (both yours and that of others), and the management of your individual career in the media and creative industries. Contributing authors are (listed chronologically): Brian Steward, Bozena Mierzejewska, Chris Bilton, Lucy Küng, Terry Flew, Philip Napoli, Toby Miller, Jane Singer, Leopoldina Fortunati, Pablo Boczkowski, Tim Marjoribanks, Keith Randle, Alisa Perren, Charles Davis, Susan Christopherson, Liz McFall, Sean Nixon, Chris Hackley, Amy Tiwsakul, Marina Vujnovic, Dean Kruckeberg, Aphra Kerr, Eric Harvey, Rosalind Gill, Annet Aris, Geert Lovink, and Ned Rossiter. By way of introducing the volume, and to give a pre-publication preview of the awesome work that all these people have done, the book's preface, table of contents, and introductory chapter (that I co-authored with Brian Steward) can be downloaded from IU ScholarWorks. Please feel free to contact me for more information, and for syllabi and course materials related to the book (in case you are considering adopting the book for a class).